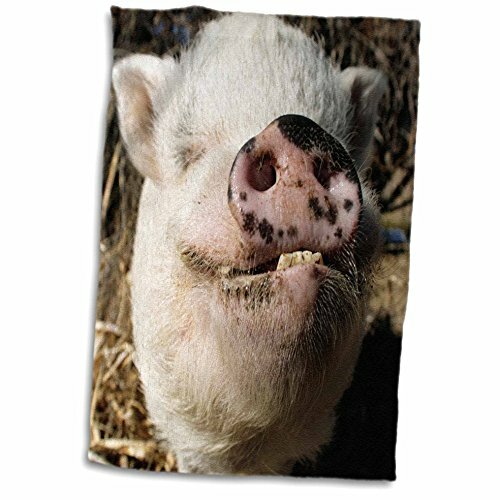 Pet pot bellied pig, farm animal, new Mexico - US32 JMR0497 - Julien McRoberts towel is great to use in the kitchen, bathroom or gym. This 15 by 22 inch, hand/sports towel allows you to customize your room with a special design or color. Great for drying dishes, hands and faces. Suitable to put in any sports bag. Image will not fade after washing. Machine wash, tumble dry low, do not bleach. Towel will regain its fullness after the first washing. Made of 63Percent polyester (microfiber)/37Percent cotton (velour terry cloth). image printed on microfiber side/terry cloth side blank.